The Frenchton is a designer hybrid breed consisting of French Bulldog and Boston Terrier. The breed originated in recent years in the United States. The purpose behind creating the Frenchton was to attempt to breed out some of the health risks associated with the French Bulldog. This designer hybrid also exhibits increased stamina as well as mass. It is not uncommon for puppies from the same litter to look quite different, as often the puppies will take on physical characteristics resembling more closely one parent or the other. The Frenchton is a relatively new designer breed, making information about the breed itself scarce. If you have further questions about this breed, consider contacting one of the accepted registries or a Frenchton breeder. The Frenchton can currently be registered with the American Canine Hybrid Club, Designer Dogs Kennel Club, International Designer Canine Registry and the Designer Breed Registery. The Frenchton can mature anywhere from 20-30lbs. The Frenchton’s coat is fine and can be long to medium in length. The Frenchton's coat can come in any color variation that is exhibited by French Bulldog and the Boston Terrier. The Frenchton is typically a very friendly, loving and intelligent breed. The Frenchton will do well with children, however, they will do best with older children that won't pull and grab at them. The Frenchton will generally get along well with other pets, but could potentially exhibit some dog aggressive behavior. It is necessary to socialize well and be your dogs firm and consistent pack leader. This breed, like any small dog, has the potential to develop Small Dog Syndrome if allowed to believe they lead the pack. The Frenchton is typically a very friendly, loving and intelligent breed. The Frenchton will do well with children, however, they will do best with older children that won't pull and grab at them. The Frenchton will generally get along well with other pets, but could potentially exhibit some dog aggressive behavior. It is necessary to socialize well and be your dogs firm and consistent pack leader. This breed, like any small dog, has the potential to develop Small Dog Syndrome if allowed to believe they lead the pack. ﻿The Frenchton is a mix of the French Bulldog and the Boston Terrier. A mixed breed dog can have a combination of any of the temperament and characteristics of any breed involved. It is recommended that you thoroughly research all breeds involved in your mixed breed puppy to ensure that you are amenable and prepared for any of the possibilities. You can find Faux Fr Bull Dog puppies priced from $300 USD to $2500 USD with one of our credible breeders. Browse through our breeder's listings and find your perfect puppy at the perfect price. ﻿The Frenchton is a mix of the French Bulldog and the Boston Terrier. A mixed breed dog can have a combination of any of the temperament and characteristics of any breed involved. It is recommended that you thoroughly research all breeds involved in your mixed breed puppy to ensure that you are amenable and prepared for any of the possibilities. The Frenchton should require the occasional brushing and baths only when needed. The Frenchton will do well indoors and are ideal apartment pets. Please be sure to research the breeds included within this hybrid for possible health concerns. The Frenchton is an intelligent breed. They will learn quickly and are eager to please. However, as the Boston Terrier exhibits difficulty in this area, the Frenchton may be difficult to housebreak. 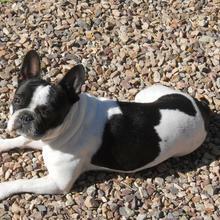 A very laid back dog, the Frenchton is ideal for indoor life. They will get by fine with a daily walk and some indoor play. Faux Fr Bull Dog Puppies for Sale - Shipped Worldwide! Finding the right Faux Fr Bull Dog puppy can be dog gone hard work. PuppyFind® provides a convenient and efficient means of selecting and purchasing the perfect Faux Fr Bull Dog puppy (or Faux Fr Bull Dog puppies) from the comfort of your home, 24 hours a day, 7 days a week. Take advantage of our PuppySearch or leisurely browse our directory of hundreds of dog breeds, Faux Fr Bull Dog dog breeders, Faux Fr Bull Dog dogs for adoption, and Faux Fr Bull Dog puppy for sale listings with photos and detailed descriptions. Some Faux Fr Bull Dog puppies for sale may be shipped Worldwide and include crate and veterinarian checkup. Many Faux Fr Bull Dog dog breeders with puppies for sale also offer a health guarantee. With thousands of Faux Fr Bull Dog puppies for sale and hundreds of Faux Fr Bull Dog dog breeders, you're sure to find the perfect Faux Fr Bull Dog puppy.